Bill Thompson is a sound artist, performer, and composer living in Aberdeen, Scotland. He has been active as a professional artist for over 15 years, both in the US and UK, as well as touring and performing abroad (Germany, Sweden, Holland, and elsewhere). His work encompasses several disciplines including live electronics, composition, and sound installations. 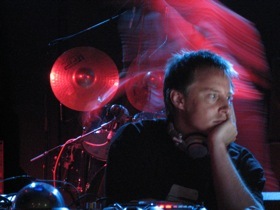 Some of his past installations/events include those for the sound festival in Aberdeen, Le Weekend in Stirling, and the Huddersfield Contemporary Music Festival. He also organized the SoundasArt conference in Aberdeen 2006, and currently curates The Burning Harpsichord experimental music programme (formerly at The Lemon Tree). As a performer, Bill uses an assortment of equipment ranging from prepared guitar, re-purposed/hacked electronics, laptop, radio, and digital/analogue synthesizers, as well as found objects and diy circuit bent devices. Regardless of equipment, an attention to sound and presence is always foremost in his approach. Bill has played with many well known artists including Keith Rowe, Rick Reed, Faust, and others and has been released on State Sanctioned Records, 7hings Records, Spectral House, Ecolirecords, Porkbones, Bremsstrahlung, Autumn records, and has work distributed by Deadline records. He has been awarded the PRS Atom award for New Music, the GAVAA award to develop a new visual software program, and various research grants by the Scottish Arts Council and University of Aberdeen.